Test on ARTIK 530 connecting to ARTIK Cloud, using ARTIK 530 Switch to control the LED through ARTIK cloud, with successful result. Refer to this Link, create the “ARTIK Cloud Light”, “ARTIK Cloud Switch” and “Temp Sensor”. 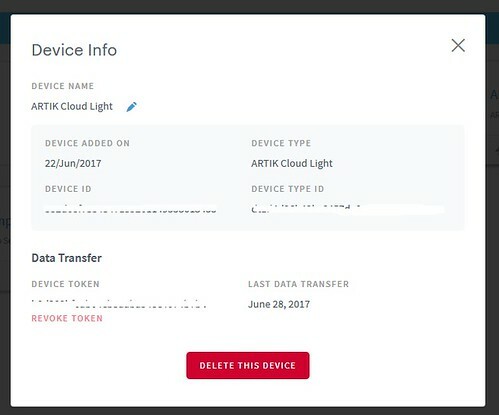 Generate the device token, device token is used for further interaction between the ARTIK Module and ARTIK Cloud. Record down the User ID, DEVICE ID, DEVICE TOKEN for later usage. Alternatively, can follow this document, use REST API to create rules. Below JS code create the rule when Switch is false, send to ARTIK Cloud Light the action setOff‌, similarly can create another rule to send to ARTIK Cloud Light the action setOn‌. Either way is working properly. var userId = " "
a REST message from another switch connected to ARTIK Cloud"
Refer to this git hub project: artik-sdk-lab, follow the procedure, all the code are working properly, remember to install ARTIK-SDK on ARTIK 530. Test at cloud side on the rule engine. Below video shows the overall procedure of the test. Now ARTIK 530 switch action connected and sent to ARTIK cloud, then trigger the ARTIK cloud rule created, the rule engine send messages back to ARTIK 530 LED to setOn and setOff the LED. Below video shows the whole procedure.